The closed Columbia Supermarket sits shuttered on Thursday, March 21, 2019. A group of western Washington County districts have endorsed the idea of renovating the defunct store into a vocational center for western and central Washington County high school students. 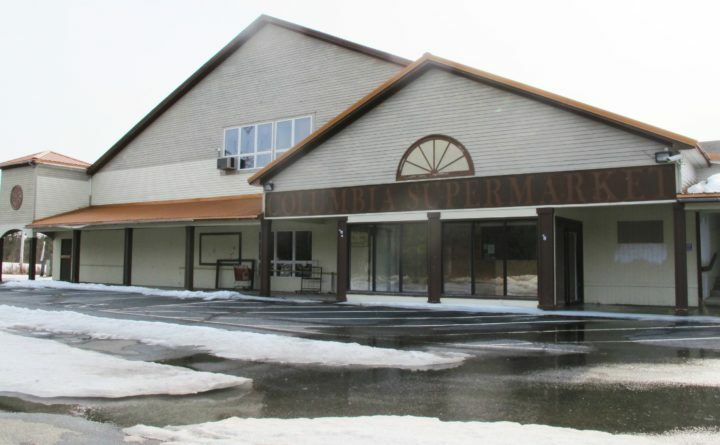 Despite being convinced that a former auto dealership was the better option, the Machias School Committee voted Monday evening to endorse a plan shared by other area school districts to renovate a former supermarket in Columbia into a vocational center for high school students. The vote ended weeks of suspense over whether Machias and a handful of western Washington County school districts could agree on where to locate a vocational center that would double the number of career and technical training programs available to students in the area. In January, Machias, Washington Academy, SAD 37, Cherryfield and Moosabec CSD had been conditionally awarded a $2 million grant from the state Department of Education to purchase and renovate a building the districts could use for a vocational center. SAD 37 includes Addison, Columbia, Columbia Falls, Harrington and Milbridge, while Moosabec CSD consists of Beals and Jonesport. The caveat from the state, however, was that the districts had to reach consensus on a site, and it set a deadline for doing so by the end of this month or it would revoke the grant and send the money somewhere else. Three of the districts voiced support for the former Columbia Supermarket in that town’s Four Corners neighborhood, but Washington Academy and Machias favored the former Blueberry Ford dealership on Route 1 in Machias. “You can’t always get what you want,” said Scott Porter, superintendent of AOS 96, which includes Machias. He said Monday evening that the town’s school board and its selectmen spent “hours” deliberating the decision over several days before deciding it should sign off on the Columbia site, which like the dealership has been vacant for a few years. “They truly believe the Ford site is the best site” for the types of programs the vocational center will offer, Porter said, which include welding, heavy equipment maintenance, automotive repair and early childhood development. “But, above all, we had to preserve these funds for the students of these school districts,” he said. Anguish over whether the group would reach consensus or lose the grant intensified last Thursday when the districts met at Narraguagus High School in Harrington to deliberate publicly on the matter, but Machias ended up saying it still needed more time to think about it. Chris Lyford, president of Washington Academy’s board of trustees, said at the meeting that the privately run academy in East Machias would not be the lone holdout for the dealership and would go along with the defunct supermarket site if that is what other school districts wanted. Members of the Machias School Committee left the meeting Thursday with plans to meet as a committee on Monday to make a final decision. Ron Ramsay, superintendent of SAD 37, said Monday evening that by reaching consensus, as difficult as it was, the school districts partnered on the project are helping to boost the county’s future. There currently are some vocational programs available at Narraguagus and Machias Memorial high schools and at Washington Academy, but the new center will offer programs for which some area students now travel to Ellsworth or Bucksport. “I’m very pleased we can now move forward and get this facility built for our kids,” Ramsay said, adding that he would have supported it if the districts had favored the defunct Ford dealership instead. The cost for acquiring and then renovating either site has been projected by a consulting architect to cost around $1 million, with the Columbia site expected to be about $40,000 cheaper overall. The dealership would have cost more to buy but less to renovate, whereas the former supermarket would cost less to buy but more to renovate, Portland architect Lyndon Keck told officials with the districts on March 11. He said neither site was ideal and that either one likely would be adequate for about 12 to 15 years. That projected lifespan would give the districts time to apply for a grant to build a new vocational center somewhere in western or central Washington County that could cost 10 times as much but likely would last more than 50 years, Keck told the group. Ramsay said Monday that, when the districts applied for the grant last summer, they had hoped they might be able to have a satellite vocational center ready for use by this September. Ramsay said that, at this point, he thinks it likely will be September 2020 before a new vocational center can open in the vacant supermarket.